“If you say you don’t have a walk-in closet, than you’re just not trying hard enough.” Cute joke, but the truth is, if you lose control of your closets then it won’t matter how hard you try. There are many reasons why our closets get away from us. Our schedules get busier, our lifestyles change, our families grow, and sometimes it just gets easier to close the doors and forget about it. With a little willpower and organization, it’s not too difficult to tame our closets and use them for what they’re best at: storing the stuff we use. 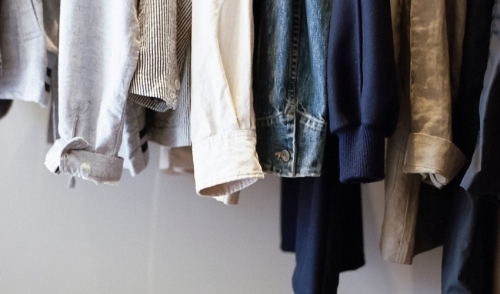 There’s a golden rule of closet organization: If you haven’t worn it in a year, then toss it. Go through your clothing and shoes and use this rule as a guideline. If those jeans don’t fit anymore, donate them. Perhaps your New Year’s resolution is to lose a few pounds? Then reward yourself with a new pair once the goal is reached, rather than hanging onto those old ones. There may be certain things that you’re not sure about letting go. Whittle them down to just a couple items and mark them with a tag or piece of tape. Once the season for that item is passed and you still haven’t removed the tag, then let them go. At least you’ve tried. Depending on the how much space you’re working with, you still may need to resort to rotating clothes by season. Purchase covered clothing racks for your attic or basement or even flat storage boxes for under you bed and rotate your fall/winter clothing with your spring/summer clothes. George Bernard Shaw once said that, “if you can’t get rid of the skeleton in your closet, then you’d best teach it to dance.” Many of our skeletons are of the harmless variety: old photos, old sentimental clothing, old collectables and hobbies. If these things mean enough to us to use up valuable space in our closets, than why not show them off? Consider making scrapbooks or albums with old photographs. Scan them digitally and make backups to preserve them, of course, and then feel free to display them. Turn those old clothes into something special by making a quilt or incorporating them into your home décor. As for your keepsakes or hobbies, why not display them? If you find that you are able to let them go, then why not list them for sale on sites like Ebay or Craig’s List? However, it may be just as rewarding to donate them to someone else who is involved in the same hobby and might appreciate their value. Free up some space in your closet and let the skeletons have their day! If you are using one hanging rod over another, put the shortest clothes on the top rod and hang the bottom one as high up as you can. The space available near the floor can be used for a shoe rack. Organize clothes by category, then color. For example, long sleeve/short sleeve, casual/dressy. Then lay them out by color. This applies to both hanging and folded clothes. You’ll locate things much easier this way. Folded clothes should have separators between them to avoid the “leaning tower” effect. Open racks are best, to eliminate the chance of mold or mildew. For smaller items, utilize drawers or clear storage boxes on shelves. Keep the most commonly used items at eye level. As mentioned above, flat roll-out bins are a great way to store closet “overflow” under the bed. Even after using the closet system, there’s still more that you can squeeze in there. Have you thought of hanging a shoe rack or pocket organizer on the back of the closet door? Belt hangers with multiple hooks are also great for bras, scarves and more! Big things are for big closets. If it’s too big for your closet, than consider the attic, basement or garage. Remember, closets are best at storing the things you need most often. Otherwise, consider storing them elsewhere. Space saving hangers can do wonders! The most common type are cascading hangers that allow for multiple items hang on one hanger, thus maximizing the vertical space. Consider a storage ottoman for your bedroom or bathroom. You’ll be able to free up more closet space and have an addition to your home décor!